Leander change table available January 2011! Leander aficionados will just love this latest addition to the family! It’s a Leander change table. We’re already in love with its smooth, rounded lines and we’re sure you’ll all be just as smitten as we are. No disappointment on the Australian availability front either – it’ll be here in January next year! So one parent is tall and and the other is pint-sized? Yep, height has always been an issue when it comes to baby gear but Leander has triumphed over this common problem with a height-adjustable platform. This is an innovation new to the change table world and is sure to convert many to the Leander way. 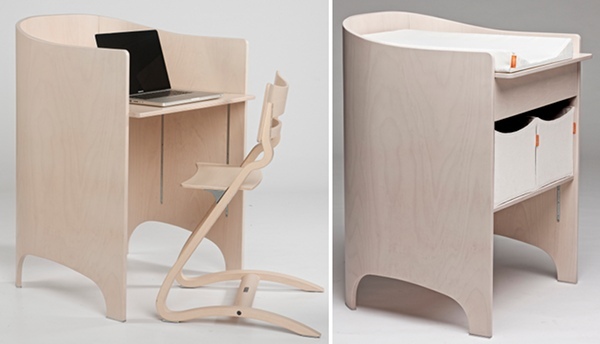 It has a drawer as well as a shelf for hiding the not-so-attractive objects of baby care and later, when the drawer and shelf are removed, the table becomes a very attractive desk under which the Leander chair fits perfectly. Talk about vision! It will retail for $1099 with lovely storage baskets in black or vanilla available as an optional extra. The Leander change table will come in whitewash, white or walnut, to co-ordinate seamlessly with the Leander cot or bed, all from Leander stockists. Thanks to Danish by Design for the heads up on the Australian arrival of this beautiful new product!